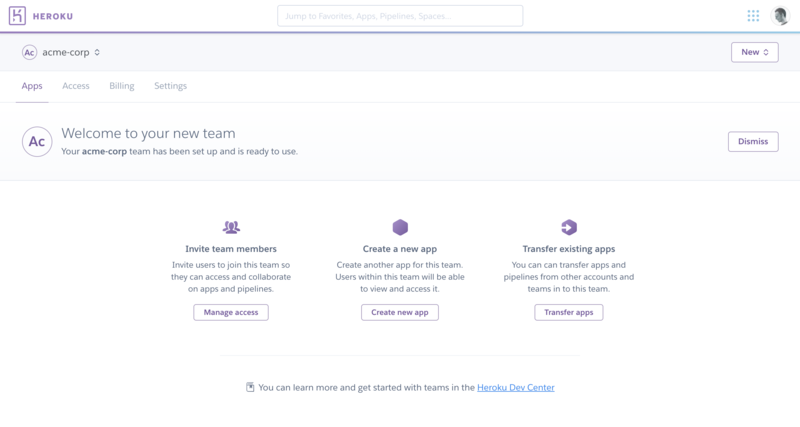 Heroku Teams (previously “Heroku Team Organizations”) provides a collaboration environment for you and your workgroup. You can invite other Heroku users, purchase and configure resources, assign permissions, delegate administration, and set up unified billing for every Heroku resource your Team uses. Heroku Teams is simple, effective support for small to medium groups building important projects. Any Heroku user can create a Team directly from the context switcher menu in Dashboard, where your Teams and Personal apps can be found. (If you are a member of any Heroku Enterprise Teams, they will be listed here as well). The set-up flow for each team you create will invite you to name your team (you can rename it in the future), then validate your identity by entering credit card information. The credit card for a given team will be used to pay for all team-owned resources. You may use a different credit card for each team, if you wish. When set-up is complete, you and any invited team members will see your new team listed in the Teams menu within the context switcher. Navigating to a team will take you the app list for that team and if this is a new team some initial actions you can take will also be displayed. Teams of up to 5 members are free. Larger teams are charged at $10 per month. Team-owned dynos, add-ons, and other services are charged at the normal rate. Free dynos, which are available for personal apps, are not available to Teams. Each Heroku account can create up to 5 Teams. Each Team can have up to 25 members. Team administrators who hit these limits and want to inquire about options should contact Heroku Sales. Heroku Teams provides simplified “Static Permissions” on apps owned by the team. Static Permissions are pre-grouped and fixed to provide for two roles: Administrator and Member. By default, new Team members have the “Member” permissions group on all apps owned by the Team. The team Administrator has “Administrator” permissions on all apps owned by the team. Administrators can assign other members the Administrator permission grouping for any app owned by the Team. The two permissions groups cannot be customized (Customizable Permissions are a feature of Heroku Enterprise). Permissions assignments are managed per-app, and can also be found under the “Access” tab for the Team. Additionally, any app owned by a Team can be “Locked” by those with Manage permissions on the app. Locking an app prevents any and all access by Team members unless the member has the ‘Manage’ permission on that app. The lock function can be used to prevent sensitive apps — such as those occupying the Production stage of a Heroku Pipeline — from being seen or accessed by unauthorized Team members. Details on the permissions necessary for many Heroku actions are covered in App Permissions and Allowed Actions. The Team navigation shows “Apps” and “Access” tabs to all Team members, and additionally shows “Billing” and “Settings” tabs to Team Administrators. The billing tab allows any Administrator to update the payment information for the Team. Developers seeking support on apps owned by Heroku Teams receive enhanced support, with a turnaround time of one business day on support tickets. There is no such commitment on tickets filed on Personal Apps. Those tickets receive best-effort response from Heroku Support. Apps owned by Heroku Teams can be powered by any supported dyno type, except for the Free dyno type. The settings tab of all apps provides an interface to transfer ownership of the app. Bulk transfer of personal apps into a team can be done from the Team Settings page or the Heroku CLI. To transfer apps using the bulk transfer features, the owner of the personal app must also be an admin of the team. Team-owned apps can be transferred to other teams, to Heroku Enterprise Teams, or to the Personal apps area of a given user. Permissions for all team members and admins on apps transferred to other Teams or to Heroku Enterprise Teams will be preserved. Apps transferred to a user’s Personal apps area will be stripped of all user and permissions associations. Apps can also be transferred to a Heroku Team from another Team, a Heroku Enterprise Team, or from a user’s Personal apps. Details on how to accomplish these transfers is at Transferring Apps. Support for operations around your Heroku Teams is available in the Heroku CLI; usage is parallel to the usage applied to the Organizations available in Heroku Enterprise. For more information, type heroku help teams or heroku help members at the Heroku CLI prompt. Note that new members “added” to a Heroku Team via the CLI will be sent e-mail invitations the recipient must click to accept. Invited Team members with as-yet unaccepted invitations who are “removed” via the CLI will have the outstanding invitations invalidated (revoked). These operations are reported in detail in the CLI feedback.